read: catch up on your awareness and slightly restore your faith in humanity. look at all that purple!! bake: mmm peanut butter. try thumbprint cookies. or be like me and add chocolate to the mix. challenge yourself: is it just me, or do you accomplish more when there's a challenge and a prize? go on, try it, and get all those books checked off your never-tackled 'to be read' list. look up: your search keywords. you're in for a laugh, i'm sure. make: gifts in a jar. you know, if you're actually seeing anyone you like at those memorial day parties. learn: what your phobia is classified as. what's your biggest fear? mine is lawn gnomes. i have no idea what category that falls under. i'm a conundrum. but, lawn gnomes come alive in the dark and kill you in your sleep, so maybe they deserve a category all their own. more avoidance: need more ideas? try aukele's list. go celebrate 'merica. happy weekend! Love this... watching Tv and reading are definitely on my list this weekend and def my favourite avoid people moves. Binging on TV and reading are my favorite things to do! Also, playing video games and snuggling the furballs. I will be for sure Netflixing, reading, and baking! House was good but it did get weird towards the end. I am glad you hate people as much as i do. I have a fear of the dark. I wish I had fun plans this weekend. I guess I'm building a deck rail. I think it can't possibly turn out worse than my ex's rail. 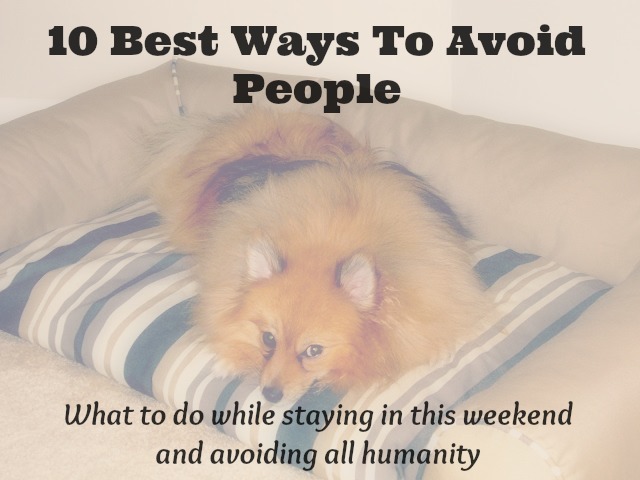 I want to avoid people this weekend but apparently my manager had other ideas because I'm working doubles all weekend (including Monday) long. -.- I'm definitely side eyeing her when I get to work later. I always have to mentally prepare for lots of family time too, I prefer quiet and comfortable but that's never how family gatherings are. I'm a Netflix addict, I always love to stay home and watch revenge. I will sit there and watch episodes back to back. Love the idea of gifts in a jar! Have you seen the cupcakes in a mason jar? Yummy! I'm holing up for a lot of the weekend, I like to use Memorial Day to ease into summer. I should go try and workout. but i don't wanna. Haha I love this. I'm totally going to spend at least half my weekend reading/Netflixing. I love gifts in a jar! I got a bunch of beauty stuff in one for Christmas and it was one of my favorite gifts! And THIS is why I live alone! ;) AHHH HA HA HA H AHA HA AHA!! It stresses me out just thinking about moving in with someone one day! LMFAO! haha I know the feeling!! I'll be doing that this fall but luckily it's with my best friend who is also anti-other people! HOUSE!!! on my gosh stephanie. you don't even know. i have watched this show so many times over and i LOVE THAT SHOW!!! stephanie. i'm so glad you are watching it. this is serious business. yes, he does get crazier throughout the show, but that just makes the show BETTER. Gifts in a jar sound like an awesome idea! I started watching Breaking Bad and almost done with Season 4. I cannot believe I didn't watch this while it was still running!